For the second and final day of the UK Moth Nationals, there was a postponement as the race committee waited for the wind to fill in and for the competitors to beat the flood tide coming into Chichester Harbour. Some helms chose to just lift their lightweight boats and walk along the beach rather than battle the tide. As it was, at the 11am scheduled start time, there was only around 3 knots of breeze so the AP was hoisted. When the breeze did finally fill after midday, it was puffy 7-8 knots leading to marginal foiling conditions. In fact typically in both fleets only around 10% of the boats were able to foil and the difference between foiling and low-riding led to a massive range of course times. Yellow course finished as usual at the finish line but the blue fleet had a shortened course due to the dropping wind. Mike Lennon in the Yellow fleet put in another solid performance with a first placing him top of the leaderboard, two points ahead of Scott Babbage who had a second. The Blue fleet was won by Chris Rast, who after a 15th and a DNC yesterday showed a marked improvement. After a short deliberation, the AP over A appeared and everyone slowly went home. 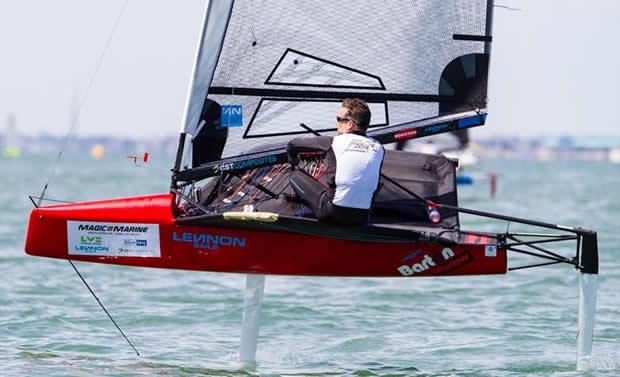 Jason Belben described the day: "The race today was pretty hard work - not physically, but mentally really because I was just trying to stay on the foils all the time because the pressure was so light. Scott Babbage added: “It was definitely a marginal foiling day, so staying up was the top priority. A lot of boats started flying from the pin on port rather than risk the congested takeoff on starboard. However, the left hand side had more wind, so the port-tackers were not the first around the top mark. There is now a day off prior to the start of World Championship, which taked place over 19-25 July.